I've finally emerged from my sick fog. I'm a miserable person to be around when I have a cold. I whine and moan and sniffle and cough so much that even I can't stand to be around me. I don't even feel like knitting. So it felt really good to get up today and work on the koigu shawl. And to catch the season premiere of "24." An awful lot happened in two hours, including the death of one of my favorite characters. I'm bummed. And Chloe's in hot water with CTU as fast as ever. Jean Smart is fantastic as the President's wife, and it was an unexpected little treat to see Matt Battaglia from "Queer as Folk" as one of the CTU guys. I did a test run tonight on taping it. It went ok so it looks like I'm all set for tomorrow night. Now back to the Koigu. I did quite a bit of work on it in Austin. 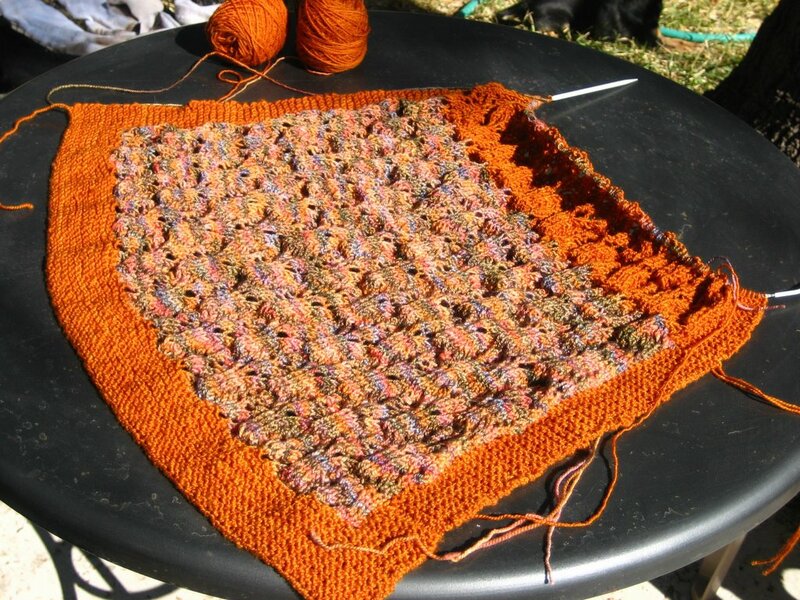 One day it was so warm and sunny I decided to sit outside and knit. The sunlight was playing so brightly on the yarn that it looked like completely different. The colors popped, and the rust/brown border turned golden/orange. I think the camera caught it. The colors are really vibrant close up. It's strange, but I was really surprised at how vivid the colors are. And then I realized that I had never really seen the yarn outside in the sun. I hope we have some bright sunny Fall days next year (which is when I should have this finished) so I can show it off in its brightest glory. I spent a good deal of time time trying to decide how I wanted to split the two yarns. 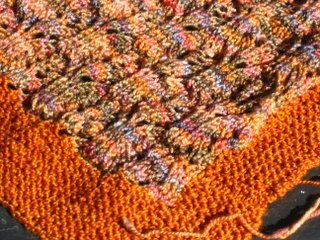 At first I thought I would work the solid in garter between the multi-colored lace. 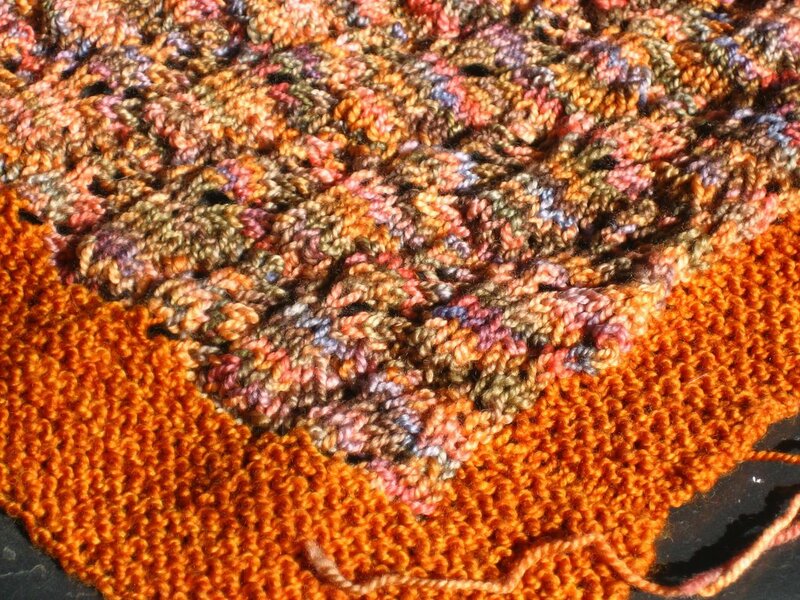 But that would use more yarn and I was afraid it would make it look like panels, which I was trying to avoid. My niece helped me figure it out and we decided it would look better if I continued the lace pattern throughout. So far it looks like we made the right choice. There was a little bit of math involved in figuring out how many repititions with each yarn I would need to have it come out the right length. If all goes as it should, it will be about 74" long. I'm about halfway done. If my brother gets his computer up and running any time soon I should have equally sunlit pictures showing more progress. I brought back a bunch of recipes I copied from a couple of cookbooks my sister-in-law has. I plan to resume my recipe testing next week. I made dinner a couple of times while I was down there. Most of them were a big hit, even with the most picky eaters. "it was an unexpected little treat to see Matt Battaglia from "Queer as Folk""
Rosanne and I did a big old girl shriek when we saw him!